Yesterday I received an email from the lovely Rose from Mixed Gems who is the beauty personal shopper at Selfridges in Birmingham. Rose wanted to let me know (and now I'm letting you know) that Selfridges Birmingham are holding a pretty exciting week long event starting on Thursday 20th October where a different brand each day will be taking to the stage to host expert masterclasses. Discover what's new at Chanel with masterclasses with international make-up artist Georgina Pratt. YSL's national make-up artist Ffion Caddick shares the latest from YSL beauty. Charlotte's personal make-up artist Nelson Catarino and her entire backstage team share the latest tips and tricks from Charlotte. National make-up artist Lampros Faslis hosts a Bobbi Brown beauty masterclass. 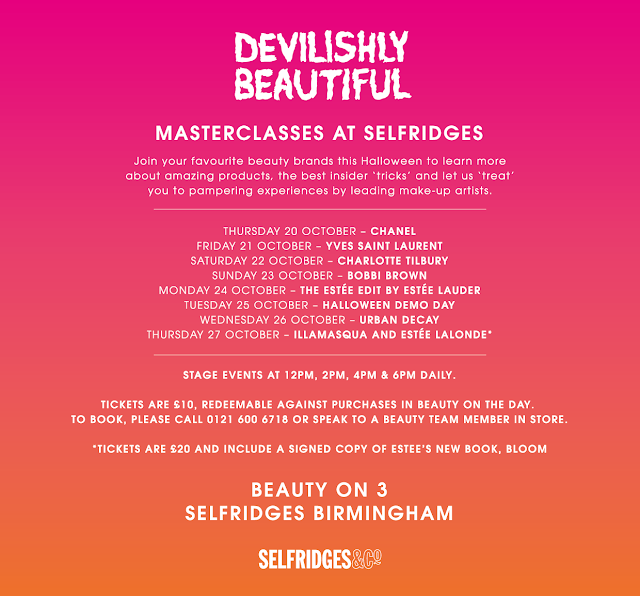 National make-up artist Melissa Gibbons holds a beauty masterclass along with a special Halloween demonstration with Selfridges' beauty personal shopper Rose. The Beauty Hall team will show you how to create frightfully good Halloween beauty looks with theatrical make-up demonstrations. The latest from Urban Decay with a masterclass from national make-up artist Danielle Roberts. Make-up artists Chloe Habachi will present a masterclass showcasing the newest products and tips from Illamasqua.